What size is everything else? 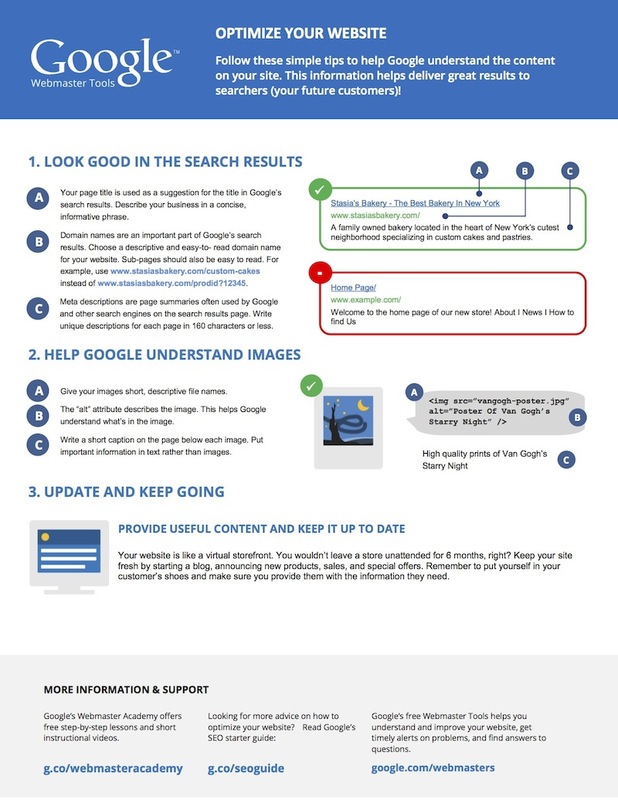 Came across this on the GOOGLE WEBMASTER BLOG today, it’s a simple 3 step guide to optimising your site. You can DOWNLOAD A COPY HERE. Not very complicated is it? As ever Google are simply trying to promote doing the basics right as these are the key elements that can make a big difference to how you perform online. Good content that is well presented will beat all the tricks and SEO magic every time. Not just links, but good links! Link building has for a long time now been a good way of proving your worth to Google, good links to your website are like roads leading directly to your content that search engines can follow. Bad links are like having to climb over mountains to get to your website and search engines won’t thank your for it! This article from SEO MOZ gives a good insight into the current state of links and how Google views them etc. The infographic below is from DEEP FOOT PRINTS and provides several good ideas and processes to get the most out of the time you want to spend devoted to link building for your website.